I love the unpredictability of travel, when even the best laid plans go a little bit wrong and you have to come up with a solution that can be even more of an adventure. Or, in this case, instead of camping, you get to stay in the lap of luxury. We were travelling around Tasmania and the night before we had camped in the highland lakes area. We had a beautiful little spot by the lake, cooked over an open fire then spent a sleepless night moaning about our deflated air mattress and listening to wallabies steal our food (they really like multigrain bread, as it turns out). We were headed to Stanley, a seriously picturesque little village on the north west coast of Tassie that was recently used as a film set for “The Light Between Oceans” (it’s a great book, and the movie is out later in 2015) and we figured we’d pitch our little tent at the campground at the local caravan park. Which was a solid plan. Until we were informed that the campground was full. All they could offer us was a couple of beds in the dormitory, which held little appeal. You know what I mean? So we took a little drive through town (it’s tiny, it doesn’t take long) and spotted a “Vacancy” sign outside an interesting spot close to the waterfront. I dialled the mobile number on the sign and a friendly voice informed me that yes, they did have a room. In fact, we could have the king suite for $220 for the night. I couldn’t say “YES” fast enough. 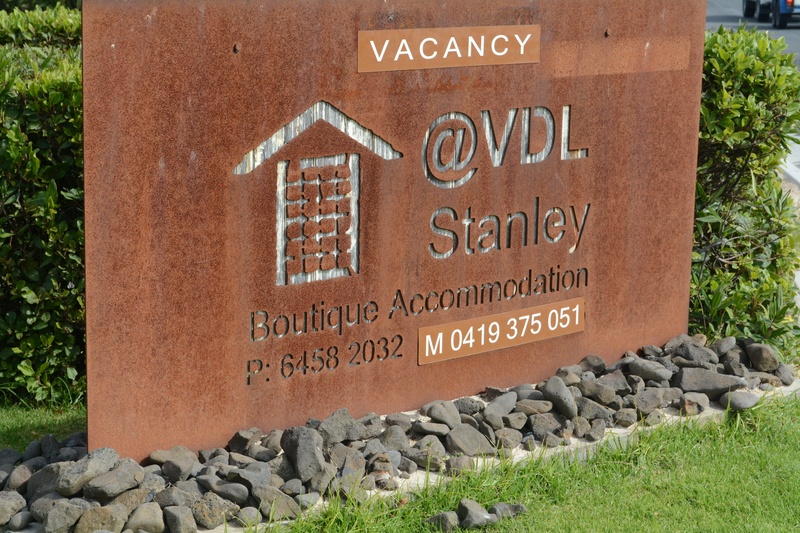 The hotel was @VDL which stands for Van Diemen’s Land. 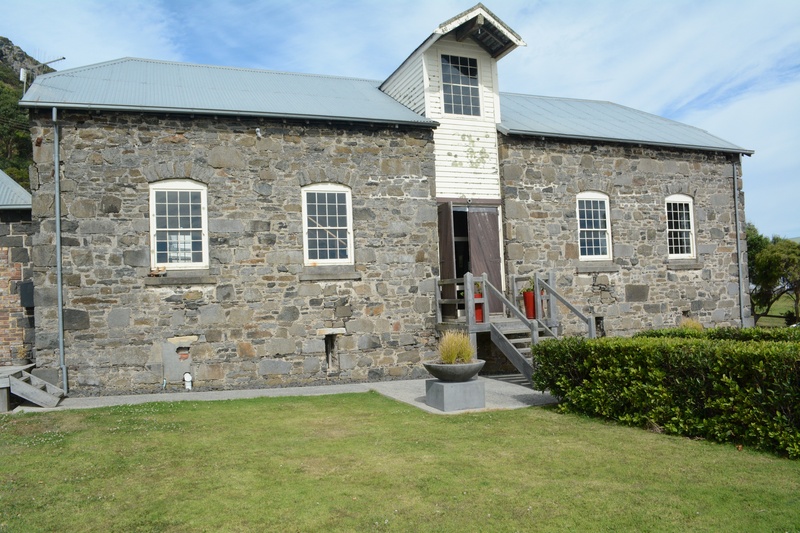 The building was once a warehouse for the Van Diemen’s Land Co (which still exists, actually), and is a striking bluestone building. But it’s the amazing fit out inside that makes this place uber cool. It’s a petite three room guesthouse, but the design and decor is jaw dropping. 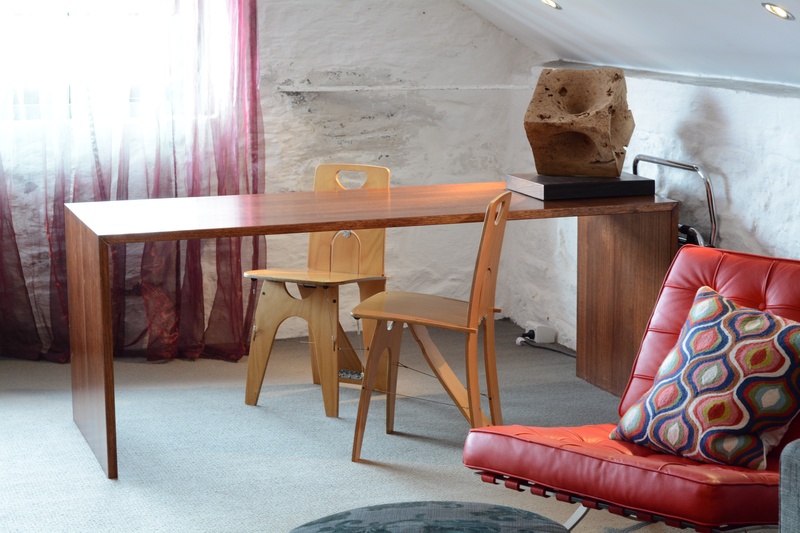 Downstairs, there was a friendly, light filled sitting area filled with funky, mid-century furniture. You could make yourself a cup of coffee, glamorously peruse a design book or stare out at the gentle waves lapping the bay. If you wanted to. The über funky sitting area where we pretended we were cooler than we actually are! Our room was the king suite, upstairs. 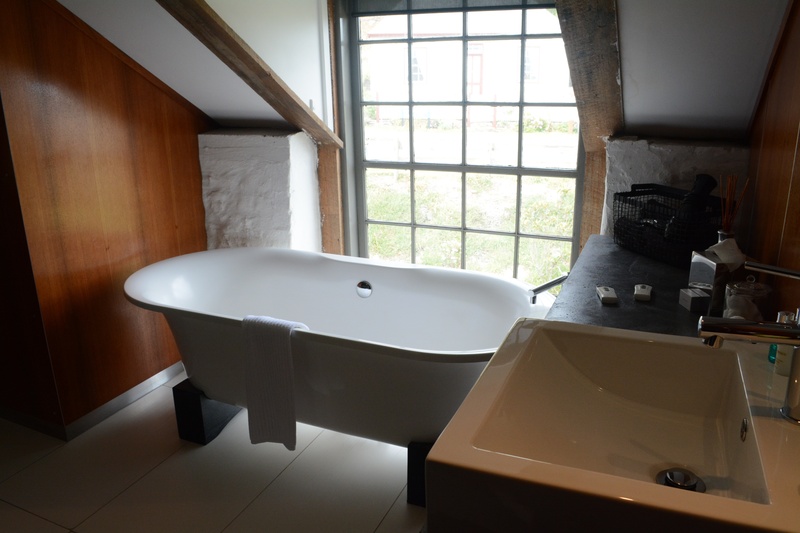 The room was enormous, with a lounge area, a desk for all that office work we were going to do, a kitchenette, a gigantic bed (with fabulous pillows) and to top it off, a magnificent bathroom with a huge bath (a word of warning, you need to lower the blinds. When you walk along the footpath on the street above, you can see straight in. We checked) and a generous shower. Everything was stylish and cool. We fell in love with it immediately. 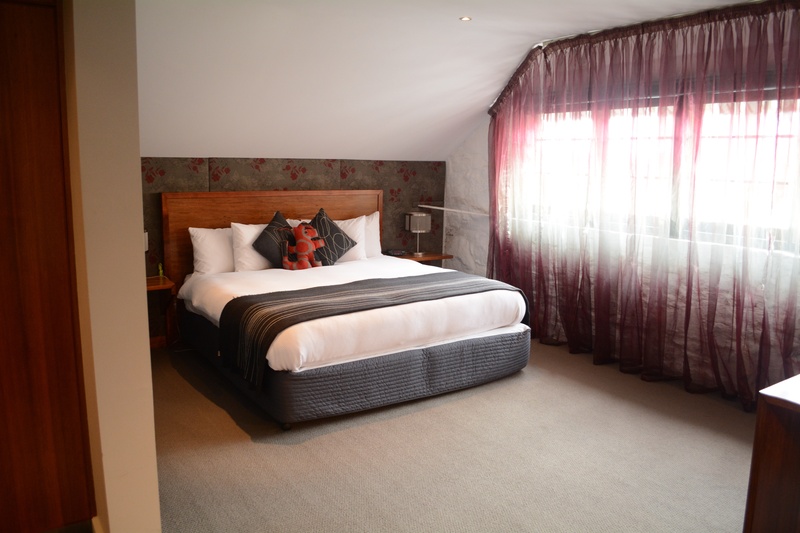 Have a look at that amazing king sized bed! The expansive study where we did lots of deals and worked exhaustively! 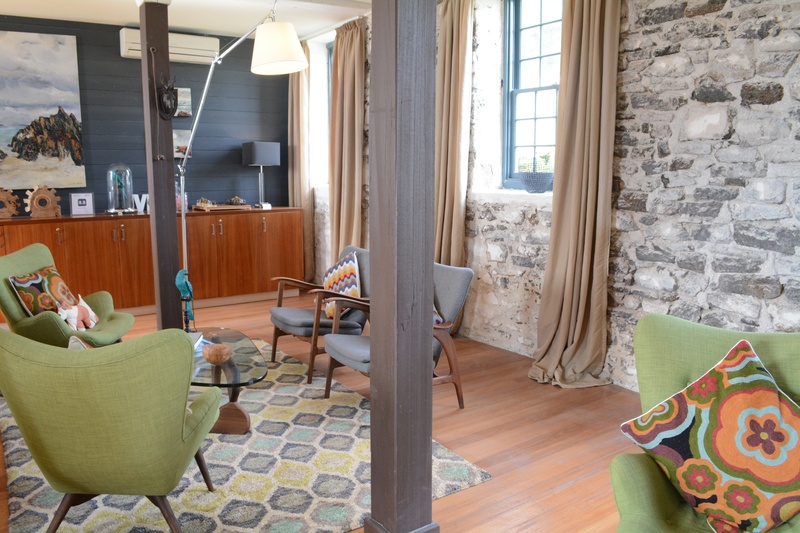 Location-wise, it’s close to the waterfront, and an easy stroll along the quaint street to the pub (where there is an excellent bistro) and an assortment of delightful little shops and cafes. Seriously, Stanley is one gorgeous little town, and @VDL is a top spot to stay. And, importantly, our mattress didn’t deflate and hungry wallabies didn’t pilfer our food. ← To Guidebook or Not to Guidebook: That is the Question!